Emerald Rangers: Blood Waves (PS4) Review. 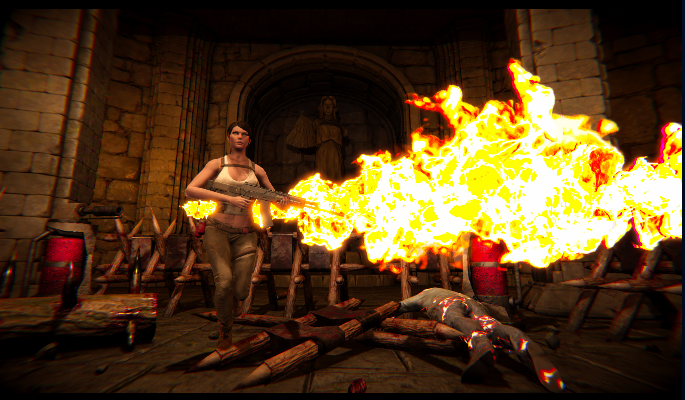 Blood Waves has you playing as an attractive female that has to kill waves of zombies in a small arena. Yeah, that's pretty much all you have to do in this game. The only other things to do in this game is to buy weapons, upgrades, and traps that you can place in the arena. You can only do the purchasing in between waves because that's the only time when the shop is open. The items are expensive and the cash comes from killing random zombies that happen to have it. The same goes for all of the other pick up items. You start off with a machete and a standard pistol and oh ever is the pistol useless. 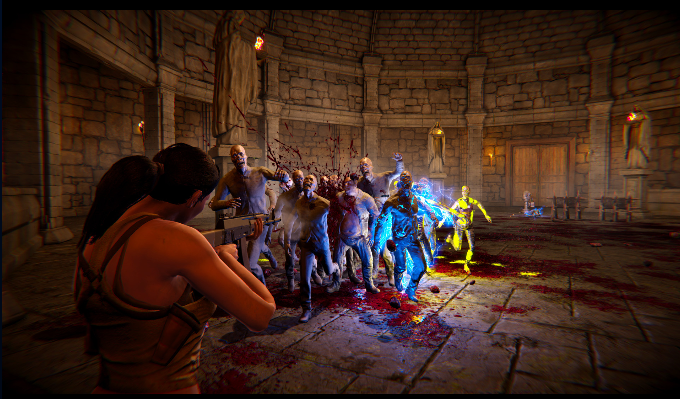 You'll need quite a few bullets to put a zombie down and reloading the gun is slower than the zombies themselves. I find using the machete is the best option for the earlier waves because it is fast and effective. The downside is that it'll drain your stamina, meaning that you'll need to walk away from the zombies while it recovers. Upgrading the stamina is a must for if you want to survive. The traps are also very effective and the more expensive ones are very satisfying to use because they insta-kill the zombies. 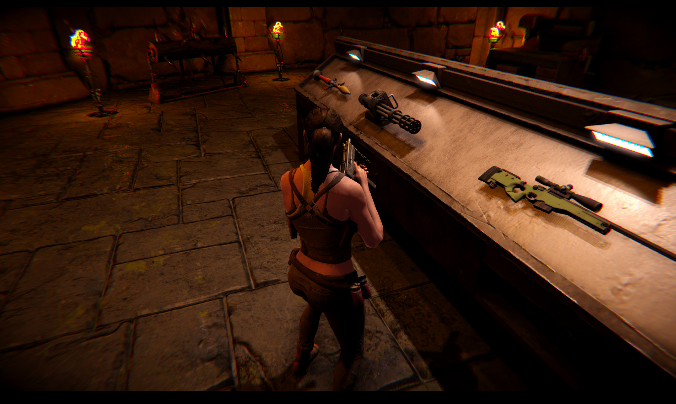 Choose your upgrades and items carefully, different types of zombies are introduced deeper into the game and they aren't to be messed with. Once you get a game over, you'll have to start the game from scratch. Yup, this game doesn't save your upgrades and purchased weapons. I neither loved or hated the gameplay. It was very functional and there's an actual game here. I just didn't have much fun with it and it got dull very quickly. I wish that there was more to say about the gameplay, but there isn't. Blood Waves is about as basic as an Atari 2600 game. I did find it hilarious that when the zombies do manage to kill you, they don't dine on your corpse. Instead they just run away in fear, like they are worried that the cops will be after them for killing a person. 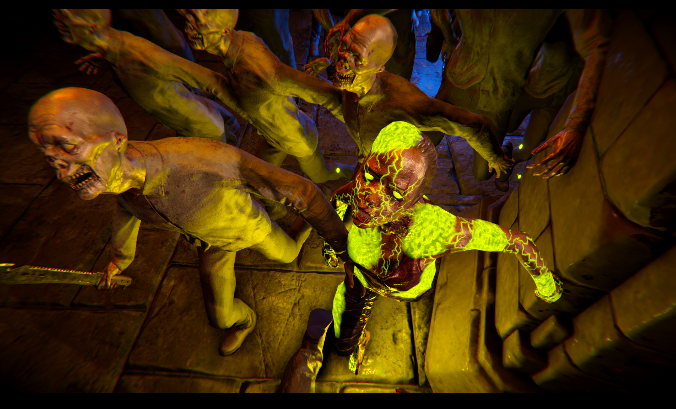 That's a very silly thing to see in a game about zombies that want to eat your flesh. Maybe they were afraid of social media backlash for having their female character being devoured by undead males. Nah! I'm pretty sure that it was just due to pure laziness. The graphics are clean but all of the designs are really generic and dull. The one detail I liked was that when the machete slices the zombies, it left some pretty deep cuts on them. It added a believable effect. The music is just generic thrash metal and it only helps to make the game feel really cheesy and would've been better off without it. 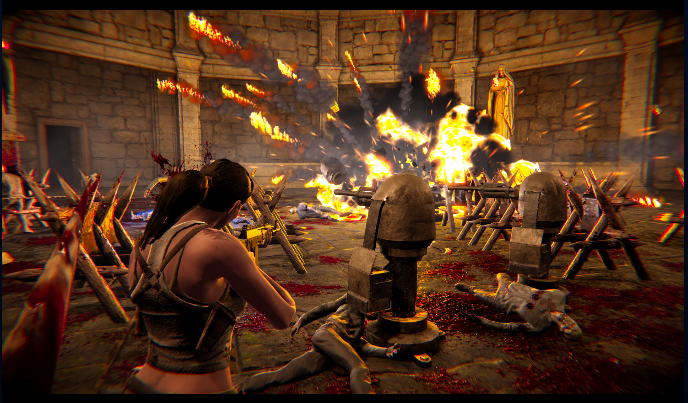 The sound effects are also generic but they work with the game. 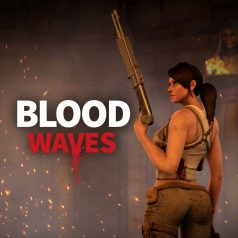 Overall, Blood Waves is a very average game that will entertain only the most bored of gamers. 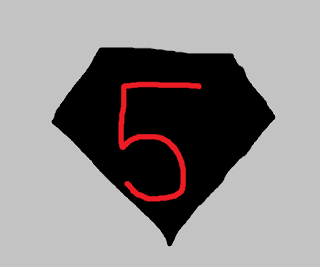 I m giving it a 5 out of 10.